Smart contact lenses sound like science fiction. But there’s already a race to develop technology for the contact lenses of the future — ones that will give you super-human vision and will offer heads-up displays, video cameras, medical sensors and much more. In fact, these products are already being developed. Sounds unreal, right? But it turns out that eyeballs are the perfect place to put technology. Smart contact lenses are like implants but they don’t require surgery and can usually be removed or inserted by the user. They’re neither on nor under the skin full time. They’re exposed to both air and the body’s internal chemistry. Contact lenses sit on the eye, and so can enhance vision. They’re exposed to both light and the mechanical movement of blinking, so they can harvest energy. What you need to know is that smart contact lenses are inevitable for all these reasons. Here’s what you’re going to see, and sooner than you think. The latest Verily smart contact lens is actually injected into the eyeball, according to a recently published patent. So it’s less of a contact lens and more of a surgical implant. The process is vaguely gruesome: Your natural lens is removed from your eyeball. A fluid is then injected into the eye, and that fluid fuses with the eye’s lens capsule as it solidifies. Inside this new, artificial lens lives storage, battery, sensors, a radio and other electronics. The artificial lens would take over the job of focusing light onto the retina, improving vision in numerous ways without glasses, but in a flexible, interactive way. One of the coolest applications for smart contact lenses is the improvement of vision without glasses. Researchers at the University of Wisconsin, Madison, have invented a smart contact lens that can instantly focus the eye. It’s under development as a future product for an Israeli company called Deep Optics. The idea is based on the eye function of the elephant nose fish. The lens uses electronic circuits and light sensors, which are powered by a solar cell, all built into the contact lens. When the sensors determine that the eye needs to focus, the chips command a small electrical current, which changes the focal length of the lens in a fraction of a second. The lens is designed to treat farsightedness, which affects nearly 1 billion people. The researchers say the technology is at least five years away. University of Michigan scientists are building a contact lens that can give soldiers and others the ability to see in the dark using thermal imaging. The technology uses graphene, a single layer of carbon atoms, to pick up the full spectrum of light, including ultraviolet light. The graphene was integrated with silicon microelectromechanical systems (MEMS). As you might expect, there’s some U.S. military funding behind the project. The ability to see augmented and mixed reality content or to take photos and videos (or both) with Google Glass was a great idea. But everybody slammed the nerdy look of wearing all that gear on your face. What if all that functionality were shrunk into a contact lens? Sony applied for a patent for a smart contact lens that can record video. You control it by blinking your eyes. According to Sony’s patent, sensors in the lens can tell the difference between voluntary and involuntary blinks. (This was a feature of Google’s Glass prototype, which could take a photo when you winked.) When it detects a deliberate blink, it records a video. Sony’s contact lens would be powered by piezoelectric sensors that convert eye movement into electrical power. It would involve extremely small versions of all the parts of a modern digital camera — an auto-focusing lens, a CPU, an antenna and even on-lens storage. Samsung has been granted a patent in Korea for technology that functions like a tiny, smart contact lens version of Google Glass. It’s got a miniature display that projects video directly into your eyes. The experience would be something like mixed reality, such as Microsoft’s Hololens or Magic Leap. Like the Sony lens, it has a built-in camera and is controlled by blinking. Unlike the Sony camera, however, the Samsung invention zaps content wirelessly to a smartphone for storage and processing, rather than storing it on the contact lens. Speaking of Magic Leap, a secretive mixed-reality startup backed by Google that has raised more than $1 billion, the company has also filed a patent application for a smart contact lens. Its patent is similar in concept to Samsung’s. Magic Leap is already building a bulky, mixed-reality headset comparable to Microsoft’s HoloLens, which appears to the user to inject computer-generated images into the real-world field of view. Magic Leap’s new patent describes contact lenses that do something similar, but without the bulky headset. The Magic Leap patent describes two processes, both working in tandem. One puts an image on the contact lenses to create the appearance of a virtual object floating in the real world, and other tells light how to appear “focused” on a specific focal point in space. Other companies are working on smart contact lenses that are designed to help with various medical conditions. Columbia University Medical Center researchers are working on smart contact lenses that can tell if a patient’s glaucoma is progressing especially quickly. By having a patient wear the lens for just 24 hours and constantly monitoring the curvature of the patient’s eye lens during that time, doctors can get a much better handle on the progression of the disease. 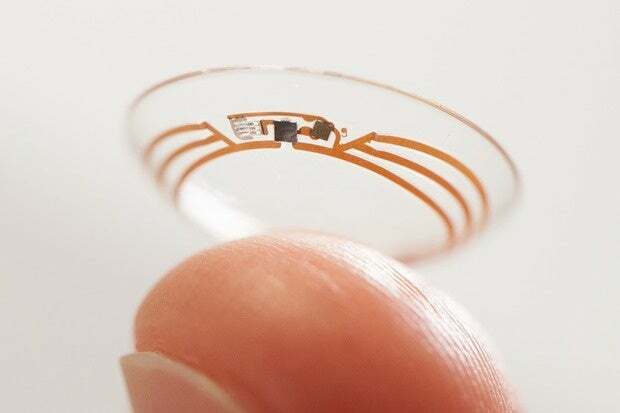 A startup called Medella is working on glucose-measuring smart contact lenses, which use sensors and tiny chips in the lens to monitor glucose levels and then use an antenna to zap the data to the users’ smartphone via Bluetooth, a concept similar to Verily’s project. These medical sensor contact lenses will probably be the first on the market, possibly within two years. However long the time frame may be, ever-shrinking electronics are as inevitable as death and taxes. That inevitable shrinkage will inspire all kinds of ideas for electronic smart contact lenses, including many that we haven’t heard of yet. We can also look forward to smart contact lenses working in tandem with other wearables, including (and especially) hearable computing devices, which will give us most of the benefits of smartwatches or smartphones but without any visible electronic gadget. And it’s all coming sooner than you think. Don’t blink, or you’ll miss the smart contact lens revolution.